PETALING JAYA: With six new projects coming onstream in the Klang Valley next year, the retail property market is expected to see a consolidation in occupancy and rental rates in the next few months. 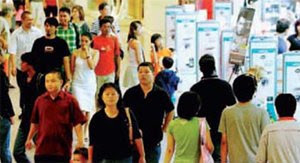 Retail property consultants said while popular malls in good locations including Suria KLCC, Mid Valley Megamall, Sunway Pyramid and 1 Utama would continue to record full occupancy and business growth, those located in less sought-after areas would face a slowdown. 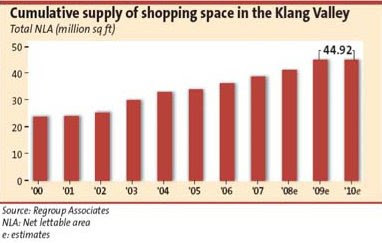 In its third quarter 2008 retail market report, Regroup Associates said the average vacancy rate in Klang Valley shopping malls rose by a marginal 0.3 percentage point quarter-on-quarter to 7.5%. Three new retail centres will be completed in the suburbs in the fourth quarter, namely AEON’s AU2 in Wangsa Maju, Giant in Kota Damansara and the Tropicana Mall in Petaling Jaya. They will add 924,000 sq ft of net lettable area to the market. “Kuala Lumpur registered a higher vacancy of 11.2% compared with the suburbs which registered only 3.9%. The overall dilution in retail because of the major increase in supply, totalling 4.2 million sq ft last year, has dampened the appetite for many mainstream brands,” the report said. Regroup Associates managing director Allan Soo said there was still room for rental growth in the more popular malls from the current average rate of between RM20 and RM45 per sq ft.
Suria KLCC is commanding some of the highest rental rates in the industry with some prime lots going for more than RM80 per sq ft although its rates average around RM50 per sq ft.
Of the existing 114 retail centres including hypermarkets in the Klang Valley, Soo said only about 20 were good ones, 10 above average and the rest considered under-performing, in terms of retail sales and rental rates. ECM Libra Investment Research said retail centres in the city seemed more saturated with average occupancy of 88.8% compared with 96.1% in the suburbs. It said while the Klang Valley market was saturated with the current supply at 38.2 million sq ft, certain suburbs, such as Setapak and Cheras, continued to be under-served. “The recent entry of institutional investors as owners of retail centres will improve the quality of the retail market in the long run,” it said. If developers proceed to build according to their plans, a further 4.3 million sq ft will be added in the next two to three years. Meanwhile, retail consultant and former president of the Malaysian Association for Shopping & Highrise Complex Management, Richard Chan, urged mall owners to upkeep their properties and ensure they are well managed. “Retail centres are not homogeneous products and there are many factors besides location and demographics that determine their success or failure. “Successful malls need to be well managed to attract the crowd. Going forward, for malls to be successful they must have good lifestyle elements such as popular food and beverage outlets,” Chan said. He said suburban malls were gaining popularity with strong occupancy rates of more than 90% for the new malls coming onstream soon. Tropicana City in Petaling Jaya has achieved a 90% occupancy rate while the expanded IOI Mall in Puchong and AU2 in Wangsa Maju are fully leased out. MK LAND Holdings Bhd, a property developer, aims to sell non-core assets worth up to RM400 million to fund new projects that will be launched from next year. The developer also plans to sell 9.2ha at its Damansara Perdana township in Petaling Jaya for RM200 million and pockets of land elsewhere to pare debt. "This is all part of our reorganisation strategy to turn around MK Land," chief executive officer Tan Sri Mustapha Kamal Abu Bakar told Business Times in an interview in Damansara Perdana yesterday. Mustapha Kamal, who returned to helm the company in June after a brief spell with his private companies, outlined the details of his three-year plan to rejuvenate MK Land last week. Central to the plan is the sale of assets. They include properties under its leisure and education divisions, such as the Bukit Merah Laketown Institute of Allied Health Sciences, Taiping Golf Resort and Bukit Merah Laketown Resort in Perak and the Langkawi Lagoon Resort in Kedah. MK Land is in talks with potential buyers for some of the properties and hopes to seal deals next year, Mustapha Kamal said. As for new launches next year, it has lined up the Northwest project in Damansara Perdana comprising hillside semi-detached homes. It will also relaunch Armanee Terrace Block B. Both are worth some RM250 million collectively. MK Land has eight current projects in Kedah, Perak and the Klang Valley worth more than RM10 billion. Since Mustapha Kamal took over on June 25, MK Land has returned to profitability, after losing money in 2007 and 2008. In the first quarter to September 30 2008, it posted net profit of RM4.9 million while revenue more than doubled to RM77 million as it sold 240 completed units between June and October. MK Land has appointed Lau Shu Chuan, Balasundram R., Fatimah Wahab and Yusof Abu Othman as chief operating officers to handle specific tasks. The four were roped in from Emkay Group and its associate firm, Setia Haruman Sdn Bhd, the master developer of Cyberjaya. Emkay Group is controlled by Mustapha Kamal. Besides developing low-, medium- and high-end properties, MK Land will also develop purpose-built office buildings to enhance profit margins. It also plans to venture into India and Brunei. CAIRO: The Dubai state developer building palm-shaped islands off the city's coast said on Sunday it has cut about 15 percent of its staff amid a work slowdown - the clearest sign yet that the Gulf's property boom is hurting from the global economic slump. Nakheel, which is owned by the emirate's government, said in an emailed statement that 500 employees have been laid off and it is scaling back work on some of its most ambitious island-building projects. In response to questions, the company said sales have slowed as a result of tighter liquidity globally and that buyers today - unlike the property-flipping speculators that helped fuel Dubai's rapid boom - "are more focused on long-term investment opportunities". Speculation has been growing that Nakheel would be forced to curtail some of its plans even as the company put on a brave face in response to the worldwide slowdown. Less than two weeks ago, the company's chairman co-hosted a US$20 million (US$1=RM3.63) red-carpet party to launch its first palm-shaped island and the Atlantis hotel located on it. Its hotel division last week welcomed the arrival of the storied cruise ship Queen Elizabeth 2, which will be turned into a floating hotel moored alongside the island, known as Palm Jumeirah. Projects that Nakheel said it is delaying include a hotel being built with Donald Trump on the Palm Jumeirah, the only man-made island project the company has completed. Work is also being slowed on the Waterfront and Palm Jebel Ali - two even larger archipelagoes being created in the Persian Gulf. Development of another series of islands arranged like the solar system will be restricted to preliminary engineering studies, Nakheel said. A number of other Dubai developers have laid off staff in recent weeks, though none of the cuts have been as large as Nakheel's. DUBAI: Dubai is experiencing an increase in defaults in high-end properties as financing conditions worsen and is likely to see smaller property developers merge, a member of the emirate’s financial crisis committee said on Sunday. “There are more and more defaults on the high end, if banks do not give mortgages and speculators are high (in number) in the market,” Marwan bin Ghalita, chief executive of the Real Estate Regulatory Authority told Reuters in an interview. Bin Ghalita said now would be a good time for smaller developers to join forces, and that he expected some to do so. “If you look at the market, a merger between smaller companies would give it confidence. I always support and encourage good mergers in any sector if it adds value to the sector,” he said.